This morning, hundreds of members of our Canadian partner union Unifor blockaded D-J Composites in Gander, Newfoundland, where 30 Unifor members have been locked out for 646 days by their Kansas-based employer. 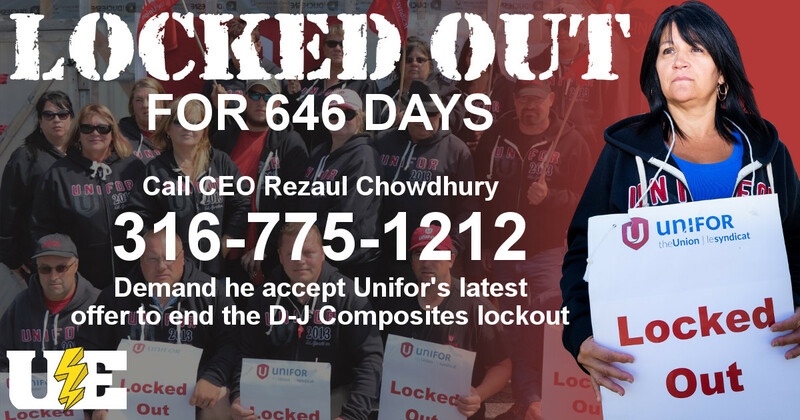 Show your support for these brave workers by calling D-J Composites’ CEO Rezaul Chowdhury at 316-775-1212 and tell him to accept Unifor’s offer to settle the lockout. You can also keep reading for other ways to show your support. D-J Composites has been found guilty of bargaining in bad faith, but the Newfoundland provincial government has been unwilling to force the company back to the bargaining table. D-J Composites workers have been locked out since just before Christmas of 2016. Learn more about the lockout, and meet some of the locked-out workers, by watching this YouTube video. 1. Call and Email D-J Composites CEO Rezaul Chowdhury at 316-775-1212. 4. Let Unifor 597 know you support them by visiting their Facebook page and leaving a message.